These Mini Pumpkin Chocolate Chip Muffins are made lighter with pumpkin puree and egg whites and loaded with chocolate chips in every bite! I don’t know about you, but I’m so ready for Fall… cozy sweaters, boots and jeans, changing leaves, apple picking and of course pumpkin! 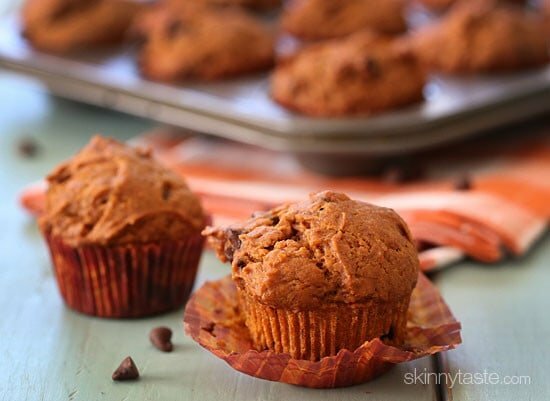 Even if it’s still warm out, these mini pumpkin muffins will get you in the Fall spirit and they are perfect for breakfast with a Skinny Pumpkin Latte or to put into your kid’s lunch box for a healthy, homemade snack. You can make them in a regular sized muffin tin if you prefer, you should get around 14 larger muffins and the nutritional info should remain the same. These mini pumpkin spiced muffins are made light with pumpkin puree and egg whites and loaded with chocolate chips in every bite! Preheat the oven to 350°F. Line a mini muffin tin with paper liners and lightly spray liners with oil for easy removal. 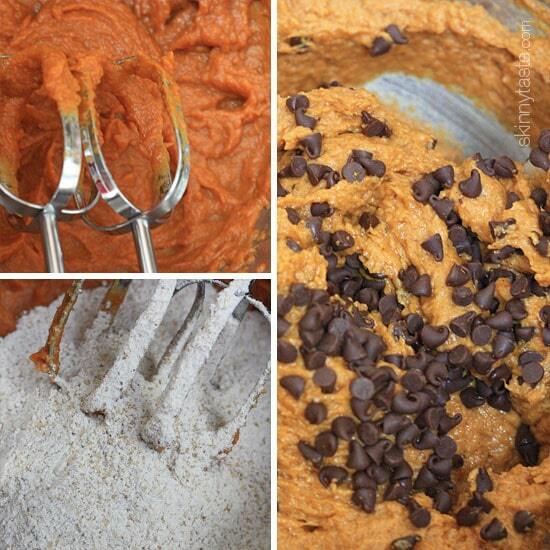 In a medium bowl, combine flours, sugar, baking soda, pumpkin spice, cinnamon, and salt with a wire whisk. Set aside. In a large bowl mix pumpkin puree, oil, egg whites and vanilla; beat at medium speed until thick. Scrape down sides of the bowl. Add flour mixture to the wet mixture, then blend at low speed until combined; do not over mix. Fold in chocolate chips. Pour batter into prepared muffin tin and bake on the center rack for 22 to 24 minutes, or until a toothpick inserted in the center comes out clean. Let them cool at least 15 minutes before serving. I made these last night and they were a hit with toddlers and adults! Also try using sugar free chocolate chips.. I made these muffins tonite and they are delicious. I love that they are mini muffins, healthy ingredients and low WW points. Gina, how long do you expect these to last? Can they be frozen well? Delicious! I reduced the sugar to 1/2 cup and they still tasted good. I didn’t have mini chips, only regular. I thought the chocolate flavor was a little overwhelming (still good, of course, but I really like pumpkin so I want to taste it), so next time I might try doing only 1/3 cup instead of 2/3 cup chocolate chips. Does anyone know the Freestyle point value if I use a regular sized muffin pan instead of mini’s? 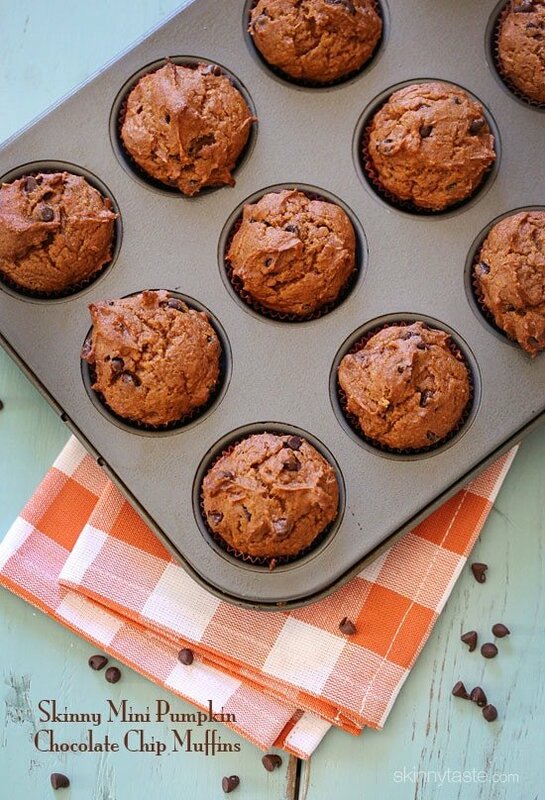 Can you share what type of mini muffin tin you use? I have a Pampered Chef one and I got over 40 muffins! Just want to try and keep the serving accurate. The plus side is my kids love them and are gobbling them up. You can’t buy pumpkin puree where I live, but I just made these with pumpkin that i steamed first and then mashed, and I used all whole wheat (ultra fine ground) flour and they turned out great! So good! Thanks for this easy recipe. My husband who is not the biggest fan of pumpkin loved the muffins. Just made these and they are amazing! I cant wait to try these. Any reason why you don’t use dark chocolate chips in your recipes? No particular reason, they would work just as great if you like dark! I loved these. I’ve found most things made with pumpkin usually stay pretty moist. These are no exception even with the whole wheat flour, which often dries things out. I used a little less sugar and might even try to use a little less next time around. There will definitely be a next time around. I also used cinnamon chips instead of chocolate chips. Chocolate and pumpkin just aren’t my favorite combo, but these would be great without chips of any flavor. All of your stuff is great. I recommend your site to anyone looking for easy, tasty, healthy meals and desserts. I’m a sweets person, which is hard when you’re counting calories and trying to stay on track so thank you for giving me some tasty sweet options that still allow me to keep my calories in check. I had never heard of cinnamon chips – you are my new best friend! Holy yum!!!! These are so, so good! I made two batches today- one with coconut oil and one with apple sauce. There was no difference in taste! Will be sticking to the apple sauce version in the future. The muffins are absolutely delicious! Can you use Whole eggs? If yes do you need to change anything? If you make these as regular size muffins, how long do you bake them for? So, I was making these on a rainy, lazy, Sunday morning with my toddler, who is actually a great kitchen helper. He was on point today, told me I mixed the pumpkin in too soon (with the floor and spices-oops! ), then as we are cleaning up…”Mom! You forgot the white stuff” (that would be the sugar!). So, we took about 2 tbs of the 3/4c of sugar and sprinkled it on the top. Threw them in the oven and hoped for the best. We each just had two!!!! So, even a few calories less now! Ha! Great recipe! Made these the other night using all gluten free flour and 1/2 cup light brown sugar . My electricity went out right before they went into the oven so the batter stayed in the fridge overnight. They were still really good and plenty sweet enough. All I have is a regular muffin tin and it made 12 regular sized Muffins. Can you substitute almond flour for the other 2 flour types? Hard to say without testing. Let me know if you try it! I made these and substituted coconut sugar for the raw sugar and used all whole wheat flour. They turned out perfect, so fluffy and moist! These turned out delicious! I made them in a regular-sized muffin tin and made a dozen out of the batter. I was debating using regular chocolate chips since I wasn’t doing mini muffins but the mini chocolate chips turned out great. Skinnytaste recipes always turn out like they are supposed to and this was no exception! What can I use, if anything beside pumpkin? My husband doesn’t like pumpkin. Or can you taste the pumpkin flavor? Thank you. Has anyone made these non-mini?? I only have a regular size muffin tin!!! These are amazing!! Huge hit! I used the suggestion and put a few of these mini’s in my Kindergarten’s lunch box!! She begged for more….so good!! These were so yummy!!!! They were our dessert tonite following our skinnytaste Salisbury steak meatballs. YUMMM!!!! Your recipes never disappoint, Gina!!! Thanks for all your hard work!!!! OH MY GOODNESS! LOVE these!!! Just popped out my second batch, So….. i think i was eating two a day and made them in a mini muffin tin that held only 12!! OOOPS! HAHA…my pants still fit fine so alls well that ends well!! If you wanted to make this recipe vegan, could you just replace the 2 egg whites with applesauce? I know you can do that with eggs, but wasn’t sure if it’s different with just the egg white. 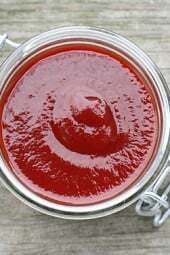 Do you use two tbsp of melted coconut oil or just 2 tbsp solid? I just found this recipe and I really want to make this pumpkin muffins today! I dont have any whole wheat flour though. Would it be ok to use all purpose flour? If so, should I use the same measurements? 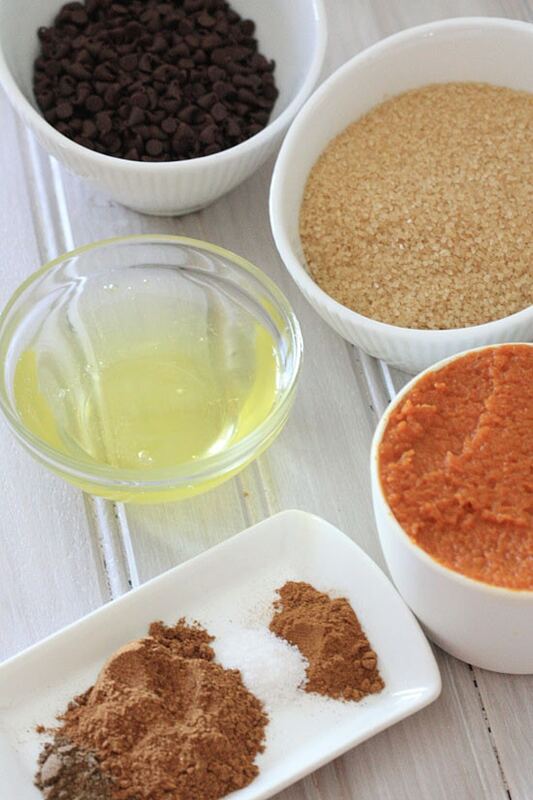 Can you use a sugar substitute? 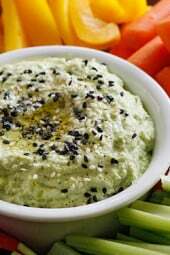 almond flour instead of unbleached flour? Made these this morning and am not disappointed-they are absolutely delicious! Substituted the raw sugar for pure maple syrup, and used all whole wheat flour, turned out amazing. I love all your recipes, use them regularly for my weekly meal plans. Thank you!! Absolutely delicious and perfect as-is! I have made so many of your recipes and not once have I been disappointed. Your site and book have become my go-to places for recipes – thank you so much! It’s wonderful to be able to try a new recipe with confidence that it will be delicious – every time!! Thank you Robin, that’s so sweet! Seems like a lot of mixture for 14 mini cupcakes. Are you talking about the itty bitty cupcakes or reg size. Help! it makes 28 mini, 14 servings as you can have 2. Gina, what would the nutritional information be if I left out the chocolate chips? If I don’t have raw sugar can I use brown or white?? Sorry if dumb question! I was wondering the same thing! Glad you asked! Looking to sub GF flour into this.. Less healthy I’m sure, but also less deadly for me. I would probably just do the flour whole hog and do 1 1/4 c. King Arthur GF flour blend.. Think that would work? Any option to reduce sugar? Will it mess it up if you just use whole wheat flour? Can anyone tell me what to replace the flour with to make these gluten free? Love the recipe wondering if there is a sub suggestion for the pumpkin? You could try apple sauce or mashed (very ripe) banana if you don’t like pumpkin. I’ve also used grated beets/carrots/zucchini in other cakes and they’ve been delicious! Just be mindful of the texture of whatever you’re adding – you don’t want it too sloppy or dry or it may affect the finished texture.. So why the egg whites and not the whole egg? Why the oil? Can we omit the oil and use the full eggs? How much would that affect fat/ calories? And how mini are these muffins? They look a lot bigger than my mini muffin baking pan. They are mini and we tested them several ways and that worked best. Can I swap out the raw sugar for something else? Like maple syrup? Just made them with king Arthur all purpose gluten free flour and they’re delicious. A big hit with the kids and soon to be devoured by my husband. Did you replace both flours with the gluten free flour? How much did you use? Thanks! The gluten free flour worked well? I am recently gluten free due to health issues and am not sure if I can just substitute the GF flour? Thanks! I substituted the whole wheat flour with almond flour and the all purpose flour With gluten free flour, they’re great! !